Press load monitoring and tool protection on stamping machines. Monitoring force vs. linear travel signals on assembling and joining operations. Sensors and transducers for process and tool monitoring applications. State-of-the-art monitoring systems for machines and processes in series production have been our specialty since 1990 and we are among the market leaders in this field. 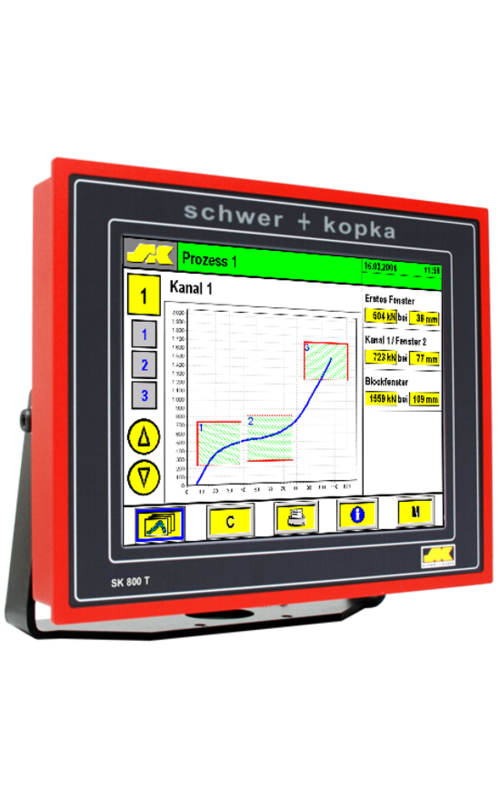 A multitude of trend-setting, technological developments come from schwer + kopka. Our monitoring systems are in use on every continent. The systems are standard production equipment in many industries and ensure our customers an efficient and high-quality production of series products such as stamped and bent parts, fasteners, formed parts, forgings, turned parts, or in assembly and joining operations. All monitoring systems from our company are ready to connect to MES, with the OPC-UA interfaces prepared for Industry 4.0 and can communicate comprehensively as machine terminals with other computer systems. For the machine operators, the process monitoring systems act as the central information control center between the production floor and the higher-level organizational systems such as MES, CAQ and ERP.